Cats love rubbing their chins on things as well as getting their chins scratched. Here’s a simple technique that lets your cat increase his quality chin-scratching time when you're not around. Wedge a flat piece of cardboard in the narrow space between a door and its door jamb. The cardboard should be at least several inches long and a few inches wide. Position the cardboard so that part of it is at about the height of your cat’s head when he’s walking. The cardboard should be oriented so that its longer side is parallel to the door and its narrower side is parallel to the floor. A snug fit is best because it will loosen over time; a section cut from a cardboard box often works well. When a kitty walks by the cardboard sticking out, he’ll enjoy rubbing his chin and cheeks on it. In addition to the tactile and territory-marking benefits he receives from scraping against the cardboard, he might be distracted enough not to request that the door be opened. Note: For best results, use this technique on doors that are in or near your kitty's frequently traveled routes or favorite hanging-out places (interior doors only, not a door leading to the outside). After a while, the cardboard will lose its stiffness, at which point you can replace it. 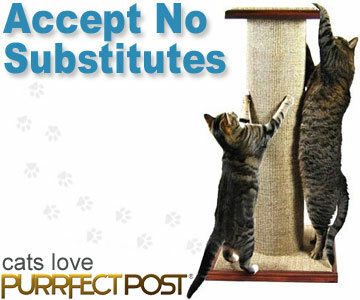 To make the chin-scratching station more attractive to nearby felines or to heighten the experience during use, rub some dried catnip on the cardboard or spritz it with catnip spray. If your cat isn’t into catnip, honeysuckle spray may have the same effect. Why Do Cats Like Boxes?